‹ PreviousHigh-Tier Swedish Medium Tanks Are Coming! We shouldn’t get our hopes high. Finally. I hope this means we will get the British light line soon too. Yes, I’m fully aware everything may change, as it’s only a supertest. But with these stats it looks very bad. It’s neither fast, nor does it have good view range or even decent firepower and the gun doesn’t look reliable either. Unless it’s super sneaky and has amazing gun stabilisation then it’s totally not worth getting. deadly accurate AND a Russian Gun straight from the local blacksmiths shop! This doesn’t make sense. The Senlac has no armour, same VR, worse gun and mobility, when it clearly needs it when compared to the Soviet. Everything else is -s-u-b-standard for an LT.
Again another LT capped at a mere 65km/h, “compensated” by having a high P/W. More fodder and silver/XP piñatas for camping TDs and Staliner-guided shells. Then again it’s not Russian, is it? And WG’s disdain for both LT and UK has been showing for quite some time. They just added insult to injury as always. One could say that… “the vehicle isn’t even finished, let’s not panic yet”. 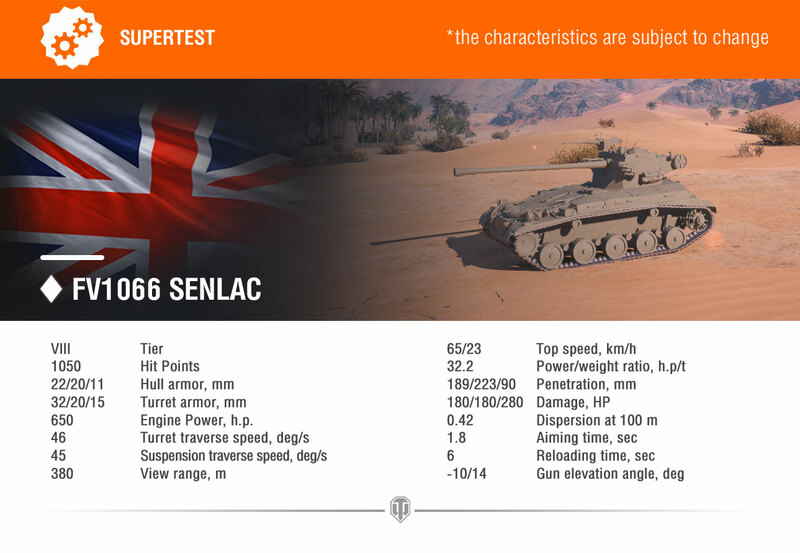 Experience has shown time and time and time again, what they refer to as “supertest” seldom ever has its stats changed after the first iteration. If this is a premium tank, don’t bother. Cromwell B is a much suited machine since it will not see Stage IIs and Type 5s while actually being able to do the same job and more in its Tier. Just saying but one of the most OP tanks is British, the T95/FV4201. While this may be true, you rarely see those nowadays. “New Tank Syndrome” for that vehicle is over already. And let’s face it: “one of the most OP is British” is preferable than “Most OP are RASJA”. could it be a hint that the British lights are finally in the works? Brit light tanks, GREAT ! Light tanks, MOAR ! Idea: At tier 5, there is no ”very high” view range light tank. I bet the tier 5 Brit tech tree light tank will have 370 view range. .42 DISPERSION WHY ARE ALL THE NEW TANKS ADDED WITH AWFUL DISPERION. BUT REALLY WANT BRIT LIGHTS. If the camo values are good enough (like, among the best in tier) then maybe it has some use, otherwise these stats are uninspiring. Maybe the premium for a Scorpion 90-Line? There is ALWAYS a faster tank for spotting enemy first. They are called russian tanks, heavy ones, medium ones, light tank ones. This thing at tier 8 would barely beat out a T34-85M from tier 6 to forward spotting positions. I guess the only thing going for the tank is that it’s the first British LT in the game (from what I know)… Which doesn’t even look good stats-wise. (Well, I suppose at least penetration is kinda decent?..) You’re still better off buying a Panhard Premium Car or a Stalinium-432– I mean LT-432.